Prāṇāyāma helps overcome the covering over light i.e it reduces Rajas and Tamas and thereby promotes Sattva in a practitioner and attunes him towards his goals. Yoga texts also celebrate the practice of Prāṇāyāma as – “prāṇāyāmaḥ paraṃ tapaḥ” – the greatest among acts of purification is Prāṇāyāma. Hence, it is proposed to conduct a textual immersion workshop on this important limb of Yoga based on Chaper II of Haṭha-yoga-pradīpikā. 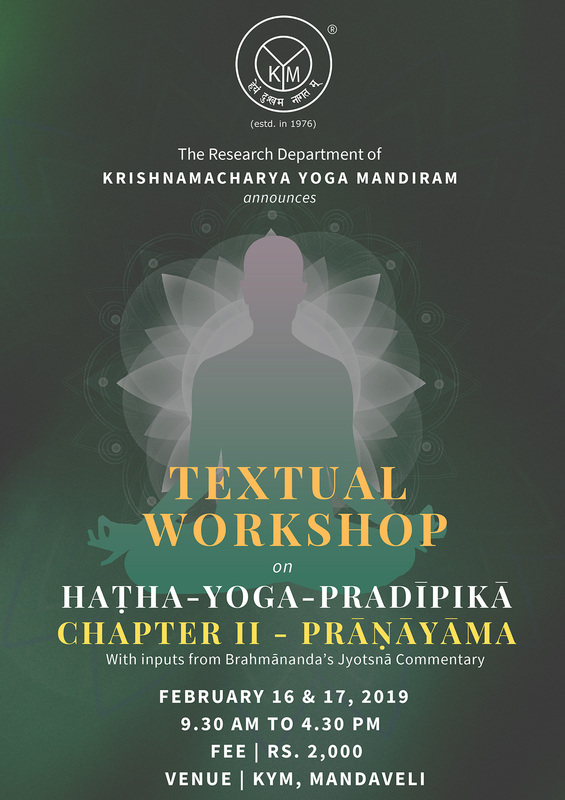 This workshop on Prāṇāyāma will be the second in the series of workshops that are being conducted by the Literary Research Department of KYM, aimed at encouraging textual study of Haṭha-yoga-pradīpikā. The first Workshop on Āsana-s from Haṭha-yoga- pradīpikā was conducted successfully on 4th & 5th of August 2017 with nearly 90 participants from across the globe. Apart from these, the second Chapter also discusses topics like – the importance of practicing Prāṇāyāma, preparations needed for the practice of Prāṇāyāma like the six Kriyā-s, and Nāḍīśodhana and the proper method of practice of Prāṇāyāma (Verses 1-43). The later portion of the chapter after discussing the eight Kumbhaka-s, deals with the classification of Prāṇāyāma and higher states/ levels of Prāṇāyāma. The text also presents eight important outcomes of Haṭha Practices (that include Āsana & Prāṇāyāma) – Haṭha-siddhi-lakṣaṇa (71-78). Jyotsnā is a unique, exhaustive and best known Sanskrit commentary on Haṭha-yoga-pradīpikā by Yogin Brahmānanda. In this workshop, all Sanskrit verses pertaining to the eight types Prāṇāyāma (Verses 44 – 70) from Haṭha-yoga-pradīpikā will be discussed in all detail, with inputs from Jyotsnā commentary. Salient and relevant details on related aspects of Prāṇāyāma from the other verses of the chapter will be duly highlighted and discussed. Practice of the Prāṇāyāma-s textually discussed will also be part of the sessions (with the exclusion of Plāvinī & Mūrchā). One Special lecture per day by Senior Yoga expert from the KYM tradition on Prāṇāyāma. commentary is a treasure house of very important & practical Yogic inputs. Yoga teachers, Yoga practitioners, researchers in Yoga and students pursuing various Yoga courses. Certificates will be issued for the participants who attend all the sessions. Handouts will be provided for all registered participants. Outstation participants are advised to arrange for their own accommodation. We will be able to suggest nearby accommodations. Yoga Practice and Special Lectures: Senior teachers of KYM.